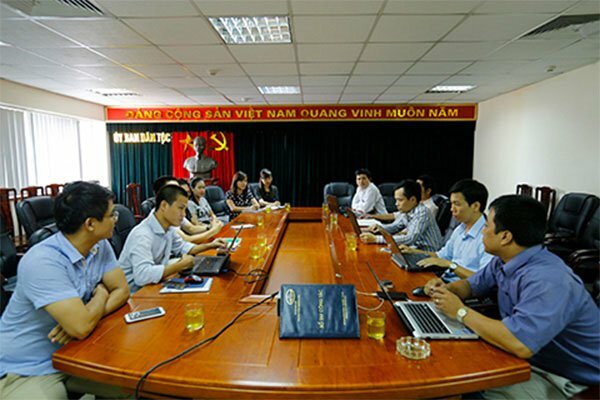 Afternoon of 27/07/2015, at Information Center – CEMA head office, CEMA hold a working session chaired by Mr. Nguyen Ngoc Ha Director of Information Center with SAVIS Vietnam Corporation about deploying project: “Building and upgrading web portal integrated with public services and operation management software system for CEMA”. Attending the session, there were Mr. Nguyen Hoang Hai – Vice Director of Information Center, Head of Project Management Board; staff of Application and Database Department and Representative of SAVIS – Project Implementation Partner. SAVIS’s Representative presented intentions and proposed plan to deploy contents of the contract: “Building and upgrading web portal integrated with public services and operation management software system for CEMA” with the main tenor of the proposal focusing on: deployment scope and scale; deployment stages and overall plan; elements to ensure success. The contract included the following articles: Building internal software system; Transfering data from old system to new one; Training. With all official web portal and other composition pages being implemented, according to SAVIS’s proposal, this project will be carried out and finished in three months from August 10th to October 14th 2015 with six stages. They are survey, analysis, design; approving the design; building and programming; testing and training; acceptance. At the meeting, CEMA and SAVIS discussed and comments for project implementation plan proposal, the opinion refers to each specific content in order to avoid obstacles in the implementation process as well as help it convenient and fit when put into use.